Charleston is not only one of the most charming, picturesque cities in America’s South, it’s a place that’s steeped in tradition and rich history, with its plantations and gardens offering a fascinating glimpse into the area’s storied past. Some of the most successful and largest of Lowcountry plantations cultivated indigo, popular for the blue dye it produces, used in textile printing and dyeing, along with rice and other cash crops. Today, many of these plantations can still be explored, having been preserved as national historic sites. Visiting Charleston’s plantations and gardens is really a must for anyone who travels to South Carolina, with their gorgeous grounds typically covered with long-hanging live oaks, Spanish moss, cypress trees, blackwater swamps and hundreds of flora species. It’s like taking an especially scenic stroll back through time, while also providing perspective into some of its dark realities and a look at just far this region has progressed since. 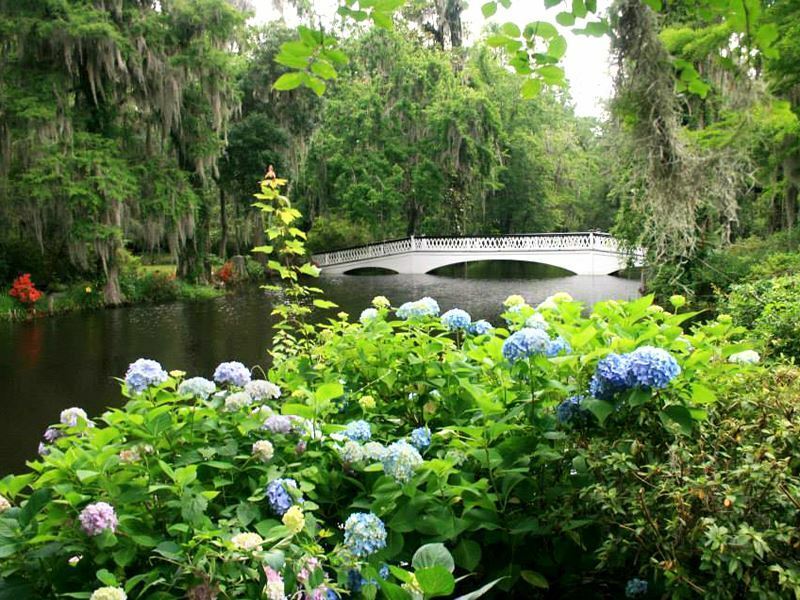 Named one of ‘America’s Most Beautiful Gardens’ by Travel + Leisure, as well as being frequently rated as the best plantation destination for wildlife enthusiasts, Magnolia Plantations and Gardens is the Lowcountry’s oldest tourist attraction. Opened to the public nearly 150 years ago, it was established in 1676 by the Drayton family, with the current Drayton family home dating back to 1873 – the two previous homes burned down during a raid on Union troops. Ten of the rooms in the home are open for tours where visitors can view the magnificent furnishings, including impressive early American antiques like the rare complete set of 18th-century China that managed to survive the second home’s fire, as the collection was in Philadelphia at the time with a loyalist branch of the Drayton family who had sided with the North. Surrounding the home are thousands of spectacular plants and flowers, with camellias and azaleas the star attraction. Planted in the mid-1800s to help brighten chilly winters, they burst into bloom in late winter and early spring. The plantation was one of the first rice plantations along the Ashley River, with the remains of irrigation canals and dikes built more than 300 years ago for cultivating the rice still visible today. Admission also provides access to a petting zoo, conservatory theater, café, gift shop and the Old African-American Cabin. Visitors can take the award-winning “From Slavery to Freedom” cabin tour that incudes multiple cabins constructed before the Civil War, conveying the history of the African-American families who were enslaved as well as the segregation era through today’s modern Civil Rights. Visitors can also embark on a variety of other guided tours like a boat excursion on the Ashley River and the Nature Tram tour, where you’ll be able to glimpse alligators, turtles and birds like herons, ibises and egrets. Located on James Island, the 37-acre McLeod Plantation Historic Site was established in 1851 and is a significant Gullah/Geechee heritage site that’s played many roles through history, including being a hospital for the Confederates, a burial ground for Union soldiers and saves, and the headquarters for the Freedmen’s Bureau. It offers a slice of living history, including an in-depth look at the slaves who once toiled away on the grounds. Those grounds are home to a sweeping oak avenue with the McLeod Oak, believed to be over 600 years old. It also includes an outdoor pavilion, slave cabins, a carriage house, gin house, barn, gardens and other structures. The show-stopping 1858 plantation house is a raised, two-story clapboard structure with glistening white columns, though the focus here is on the African-Americans who lived on the property well into the late 20th-century. The tour will bring you through the slave cabins, one by one, and then afterward you’ll be able to wander through the first floor of the home at your own pace. 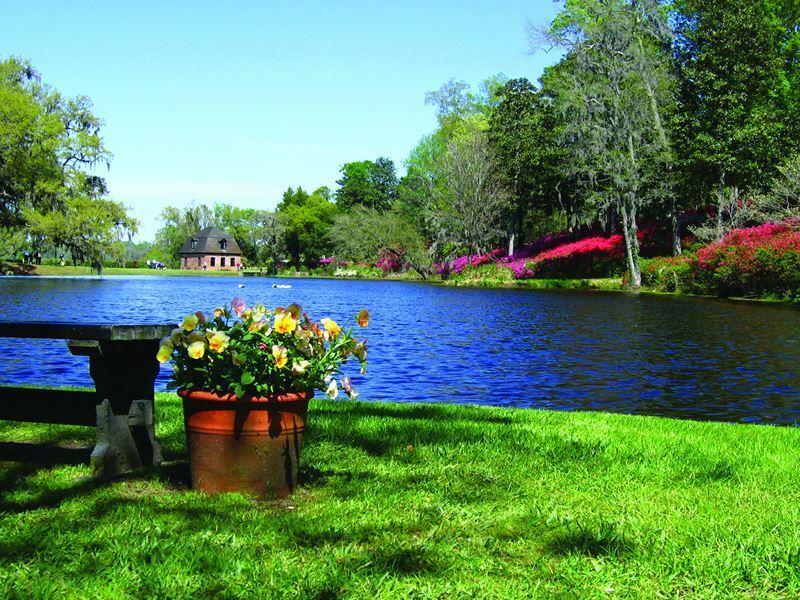 One of the most impressive plantations is Middleton Place. The 65-acre 18th-century rice plantation was the birthplace of one of the signers of the Declaration of Independence, Arthur Middleton. Today it’s a National Historic Landmark that boasts the oldest and most important landscaped gardens in America. The gardens reflect the 17th century’s European design with especially graceful symmetry that resembles the renowned Versailles Gardens in France with similar geometry and balance, along with plenty of surprises. You’ll see swans glide across the reflection pools as well as sculpted terraces and parterres, and in the spring just above the Rice Mill Pond, vibrant pink azaleas blanketing the hillside. Back in 1940, the Garden Club of America described it as the “most important and interesting garden” in the country, and that remains true today. The Middleton Place House Museum, constructed in 1755 as the gentlemen’s guest quarters, is the only building that still stands today of the plantation’s original, three-structure residential complex. The other two were destroyed by Union troops just shortly before the end of the Civil War. A tour through the house provides insight into the Middleton family who lived here for 320 years and played a vital role in U.S. history. In the stable yards you’ll be able to witness a weaver, potter, blacksmith and carpenter who recreate the activities that took place on a self-sustaining Low Country plantation. Boone Hall is the Lowcountry’s most famous plantation, established in 1681 by Major John Boone, remaining in the family until it was purchased by the McRae’s in 1955. The family and descendants of Boone were influential in the history of the state, the colonies and the country. Considered a must-see if you only have time for one, Boone Hall is frequently recognized as the top plantation to visit in the area. 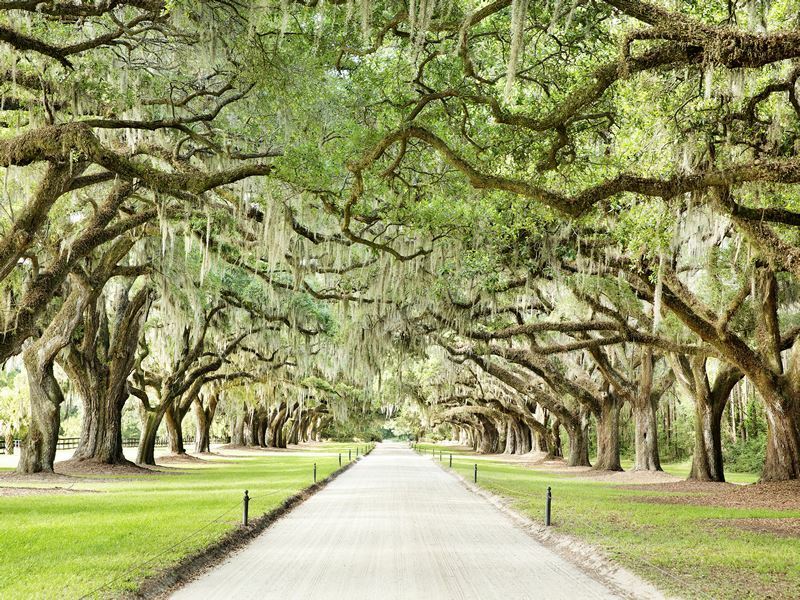 One of the oldest working, living plantations, the son of Major Boone planted the live oak trees in 1743, arranging them in two evenly spaced rows, taking two centuries to become what you’ll see today. The massive moss-draped oaks form an enchanting natural canopy and corridor that welcomes visitors in. While the plantation once grew cash crops like pecans and cotton, these days small-scale crops like strawberries and pumpkins are grown. The Georgian-style home is a more recent addition, built in 1936 with the first floor showcasing what it would have looked like in the 18th-century. The property also hosts eight original slave cabins, with audio exhibits and artefacts that depict what life was like for the slaves on the plantation. You can ride to see the highlights in an open-air coach as well as take a self-guided tour of the garden and its gorgeous roses that are more than a century old. One of the oldest pre-Revolutionary houses that remains unrestored, close to its original condition, Drayton Hall is the earliest example of fully-executed Palladian architecture, built in 1783 seeing seven generations, the Revolutionary and Civil Wars and countless hurricanes, yet somehow managing to stand the test of time. It was owned by the Draytons until 1974 when it was purchased by the National Trust for Historic Preservation. There is no plumbing, electric lighting, central heat or air, or even furnishings in the main house, allowing the beautiful architectural details to standout as the primary focus. Without having been restored, the archaeologists and other experts enjoy the rare opportunity to study the designs and materials used during each period of the home’s history, all the way back to the late 18th-century when it was first constructed. By taking a tour, visitors will learn about the Drayton family and seven generations of Bowens who were brought here as slaves while imagining what daily life might have been like then. The plantation also includes one of the oldest African-American cemeteries in the country still in use today, a late 18th-century privy building, 20th-century Freedmen’s village, former garden house, colonnades and a collection of artefacts that were recovered during excavations, providing insight into the undocumented lives of both Africans and Native Americans who were enslaved here from the 17th- to 19th-centuries. They reveal lots of interesting tidbits, including details about the estate’s creation and the residents privileged lives, as well as the realities of plantation life and the encroaching war. If you’re a tea fan, don’t miss the Charleston Tea Plantation on Wadmalaw Island. Originally a potato farm, it provides a living slice of America’s history, with acres and acres of tea plants and a tea factory. You’ll learn about how, for over 150 years, numerous unsuccessful attempts were made to propagate camellia sinensis after it first arrived here from China in the 18th-century. Success finally came after Dr. Charles Shephard founded the Pinehurst Tea Plantation in Summerville, South Carolina, becoming the first to grow tea in the U.S. After his death, the plants continued to grow wild for nearly a half-century, before they were replanted in 1963 here at the Charleston Tea Plantation. Today, visitors can walk through the production building to view the equipment that produces the tea, visit the greenhouse, take a scenic trolley ride around the 127-acre farm. and pick up tea-related items in the gift shop. 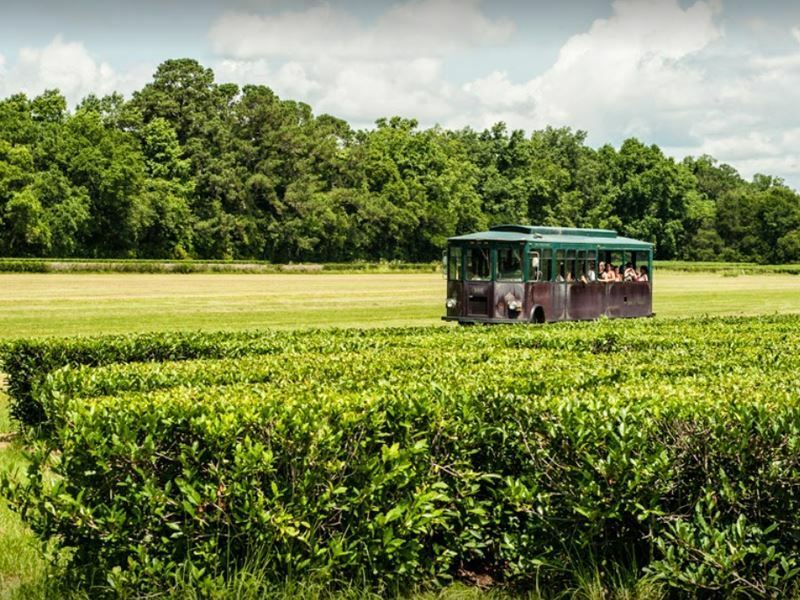 Other than the small fee for the trolley tour, there is no admission charge to visit the Charleston Tea Plantation. 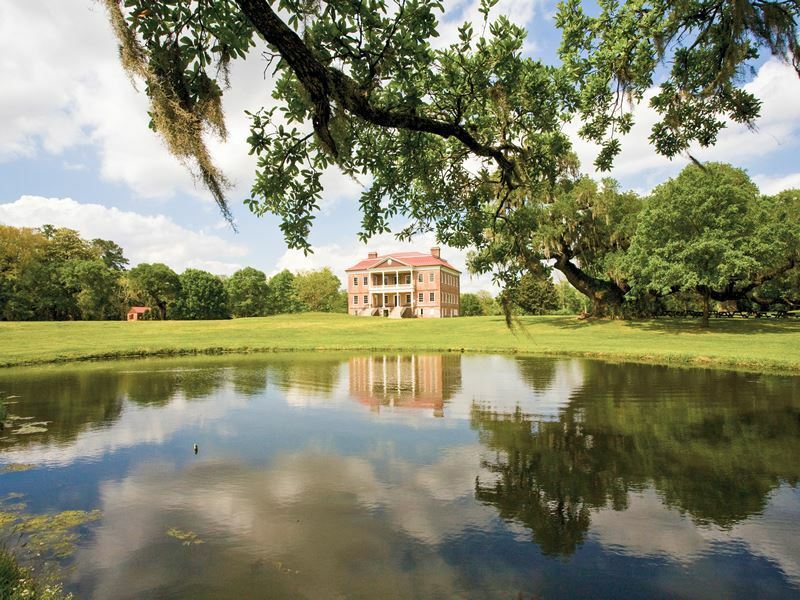 Nestled among the beautiful live oaks and magnolias, the Hampton Plantation State Historic Site is home to the last remnants of a colonial-era rice plantation. Much of the land is no longer in use and has been allowed to return to its natural swampy, wooded landscape. The main house, a mansion built in Georgian-style in 1735 can be toured, along with the plantation grounds where you be able to gaze out at the remains of rice fields which once stretched as far as the eye can see. Both the mansion and grounds serve as an interpretive site for the slavery system that helped to build plantations like this in South Carolina which generated much of the wealth in early American history. You’ll also learn some of the stories of the freed people who made their home in this region, generations after slaves were emancipated back in the mid-19th-century. 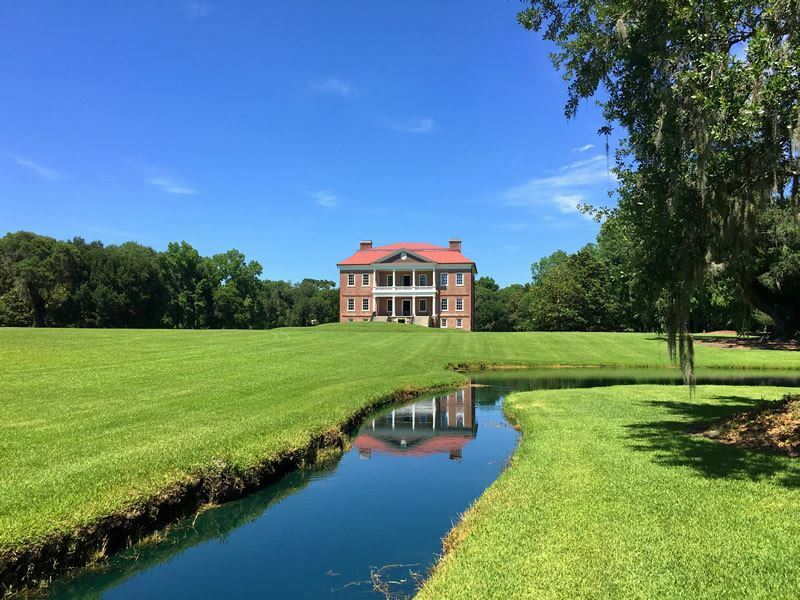 Set across 28 acres, the Charles Pinckney National Historic Site was once known as Snee Farm, a large, 715-acre rice plantation inherited by Charles Pickney in 1782. Pinckney may not be a well-known name, but he was a principal author and signer of the United States Constitution. What remains of this coastal plantation has been preserved to tell the story of this founding father who also served four terms as the governor of South Carolina, as well as the lives of African-American slaves and their influence on Pinckney. While none of the original structures remain from the time he lived here, there is an 1820s cottage that provides insight into Pinckney’s life and his plantation, along with the changing role slavery had on America.